Just before I get back to the prolonged fasting and weight loss post I thought I'd put this picture up. It's slightly modified for clarity and taken from Fig 1 of this paper. None of the 10 people in either column are being dieted, the graphs would be different under caloric restriction. 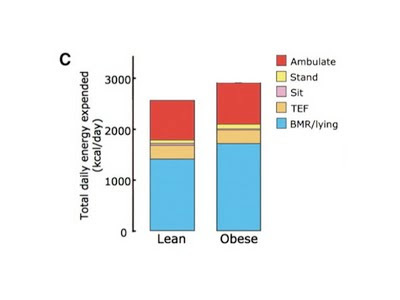 I would, all things being equal (ie a linear relationship from thin through obese to a BMI of 50), expect the obese subjects to use/lose more adipose calories per day in proportion to their obesity if you suddenly withdrew all food. There's more on the study here, which has all of Fig 1 and has not been subjected to my activity with a rubber (OK, an eraser if that's less risque). Even when heart attacks started to become a fashionable way of death at and increasingly early age, progress towards discovering their causes still lagged. This was partly because scientific theories naturally tend to be partly based on what has been most recently observed and can be most easily measured. Cholesterol was the ideal choice of culprit as it had been found on the scene of the crime by microscopists. Its footprints in the shape of characteristic clefts could be clearly seen in the walls of some of the affected arteries, where it could be stained a spectacular and guilt-ridden red colour. The chemists were also happy to testify to cholesterol being the "bad egg". There was plenty of it to measure, both in the blood and in the food, and the levels of the two and heart disease tended to bear a suspicious, albeit inconstant relationship. Being nice and stable both in and out of the body, and not one of those will-o'-the-wisp compounds whose blood levels vary wildly during the day and disappear as soon as you think you've got them trapped in a test tube, it was a sitting duck for the collection of chemically incriminating evidence. From here it was a brief exercise in ad hoc reasoning to the "It's what you eat that does it" school of thought that holds sway to this day. This originally suggested that a high cholesterol diet raises blood cholesterol to a level where it is gradually deposited in the walls of the blood vessels and builds up to cause atheroma. For various reasons, this theory was later broadened to include saturated animal fat among the dietary "baddies" in the dock along with cholesterol. Unsaturated vegetable fats, especially the polyunsaturated ones, were cast in the role of "goodies" who were able to combat the evil effects of the "baddies" [note, this was written well before the StarWars movies were released, prescient hey? No mention of The Force though]. The market soon became saturated with unsaturated food products. This was good for the circulation of grocery products and magazines with complicated diet sheets, but appeared to have little effect on the coronary circulation. Heart attack rates obstinately continued to rise. Surwit and sucrose or when is a high sucrose diet a high fat diet? The name Surwit is familiar. I have this niggling feeling that I've come across it before. There's no inclusion of the name on the blog except as the name for an obesogenic mouse diet based on sucrose. I have this feeling it was someone pointing out that a high sucrose diet was perfectly acceptable if you kept PUFA low. Can't find it. Don Matesz brought the paper to light recently by discussing it over at Primal Wisdom. It's a core paper on why you should be cautious about simply accepting conclusions from papers without thinking them through. I just wanted to pour a little arithmetic on Surwit's paper from 1997. The 1100kcal diet was 70% carbohydrate, ie 770kcal/d or approx 180g/d. Let's look at calories-in and calories-out. With a weight loss of 7kg in 6 weeks these people were augmenting their diet calories-in by adding an additional 167g/ day of fat from their own adipose tissue (assuming weight loss is fat loss, not quite true). This gives an average "calories-in" of 1100kcal from diet plus about 1670kcal/d from adipose tissue, ie a total of 2670kcal per day going in to metabolism. Calories-in of 10g fat from the diet plus 167g/d of fat from adipose tissue, with a total of 2670kcal per day used, gives us a metabolic input comprised of 66% from FAT. 120g/d of sucrose is about 540kcal/d which actually makes this only about 20% of the "calories-in" to metabolism, with fructose at about 10% of calories. The study subjects are obese which, trans fats apart, suggests that they are probably eating a great deal more sucrose per day during their habitual diet than 120g (and failing to deal with it effectively). So, in comparison to their pre study diet, this is probably a LOW SUCROSE diet. A Big Gulp is about 800kcal per serving of HFCS... At 180g/d the study diet is also a LOW CARBOHYDRATE diet compared to their pre study intake. You do not "accidentally" maintain a bodyweight up near 200% of ideal unless you have a carbohydrate intake waaaaay in excess of 180g/d. Just flick through the introduction to Grey and Kipnis yet again. Obese people eat more calories and especially more carbohydrate calories than normal weight people. Now, let's stop weight loss occurring and think about health on a 34% sucrose diet. Let's up the calories-in from 1100kcal/d to 2670kcal/d to (possibly) maintain a stable weight (it won't happen, weight will rise secondary to increase insulin levels associated with a fall in spontaneous activity) but this time let's source all of those calories from the diet. With 34% of calories as sucrose that will be just under 300g/d of sucrose. That gives an annual intake of just over 100kg, about a tonne in 10 years. HDL is already down from 1.35mmol/l to 1.06mmol/l (if you think it matters) and if you think trigs will stay at just over 1.00mmol/l on a third of a kilo of sucrose a day you are incorrect. Will the drop in blood pressure be maintained? Hahahahahahaha. Do you want to try this? BLACK BOX HEALTH WARNING: The next line is sarcasm. I'm sure it would be fine, just ask Surwit. You can't lose weight for ever. Weight loss is fat metabolism. When weight stabilises how do you maintain the benefits of fat metabolism? Hint: Don't replace it with sucrose. Labels: Surwit and sucrose or when is a high sucrose diet a high fat diet? I think Liz, Dexter and THINCS where first in with this study. Can't find it in Pubmed yet but I've got the pdf. OK, first there was TC, then LDL, then sdLDL, then oxLDL, now MGmin-LDL and there was another LDL somewhere along the line, I've forgotten which it was... I really can't keep track. Never forget psLDL (purple spotted, hint: It's made of sugar). I'm assuming everyone knows that Niaspan has recently bombed as a supplement to a statin. There's a nice summary here. "Niacin does all the things that doctors would expect to benefit patients, such as lowering bad cholesterol and triglycerides while raising good cholesterol" said Nissen, who prescribes it for his patients. Nissen's mistake was to think he was smart in the first place. Big mistake. The glimmer of light is that he might realise he's been an idiot. Apologies for not getting to reply to emails and to the comments from the last post, several will take some time and there are a few one liner posts to throw out in the mean time. This is one. I've been following the events at Fukushima with some interest, particularly as we live about 15 miles from Sizewell B, the UK's only commercial pressurised water reactor. One of those I've browsed is this one from the NY Times on the subject of the effect of the disaster on the populace of Fukushima city, where anger at the government's handling of the situation is becoming quite extreme. "A huge outcry is erupting in Fukushima over what parents say is a blatant government failure to protect their children from dangerous levels of radiation. The issue has prompted unusually direct confrontations in this conflict-averse society, and has quickly become a focal point for anger over Japan’s handling of the accident at the nearby Fukushima Daiichi nuclear power plant, ravaged in the March 11 earthquake and tsunami." Conflict-averse society is an interesting phrase, certainly to me, as I have just started to re-read Malcolm Carruther's book "The Western Way of Death". I read it as a 20ish year old bloke and stopped fitting half-race cam shafts to the engines of assorted Morris Minors and switched to a Volvo when I got the chance. The current MX5 I drive was not my idea and I still try to follow the advice to use a driver's seat as a mobile arm chair. A detailed explanation is here. This brings to mind the potential for marked injury to the residents of Fukushima, to the point where the injury from anger might outweigh any potential benefits from the hormetic effect of a modest increase in exposure to ionising radiation. Anger is bad for you. Fukushima is an angry city. This is far more worrying than the increase in ionising radiation exposure. I think we have to be very careful with the term fasting insulin. I worked out the average weights at the start and end of the study. The drop was from 135.8kg to 115.6kg, something in the region of 20kg of body weight. Obviously some of this would be glycogen, glycogen-water and muscle, but a big chunk must be fat. What happens to fasting insulin? Well, there are three different "fasting" insulins on this graph. The first is 45microIU/ml. This is the fasting insulin on the normal diet of an obese person. Second is about 38microIU/ml, after restriction of carbohydrate to 300g/d with caloric intake at 2500kcal/d. The third is between 20 and 14microIU/ml, achieved after three days total fasting and this level basically doesn't budge over the following 6 weeks, even though bodyweight drops by 20kg. This later value is a great deal higher than a non obese person would have under prolonged fasting conditions and remember that the people in this study are preselected as having failed on every diet they have ever tried and they are willing to undergo the risks of a prolonged water fast. They do not appear to be hyperinsulinaemic as a consequence of their excess weight if a 20kg acute weight loss has no effect on blood insulin levels. The blood glucose normalises within three days of the start of fasting. At this point physiology's role is to control hepatic glucose output. All tissues which use glucose via insulin should have stopped accepting glucose to spare it for the brain. In these people the level of insulin required to do this in the region of 10 times that of a spontaneously slim person. Obviously, if you perform a cross sectional observational study of fasting insulin vs bodyweight there will be a positive correlation between the two variables. It is a perfectly valid hypothesis to propose that obesity CAUSES hyperinsulinaemia. Equally, if you are as stuck in the rut of fasting insulin inhibiting inter-meal lipolysis as I am, it would be perfectly reasonable to hypothesise that people with the highest fasting insulin are the fattest because hyperinsulinaemia CAUSES obesity. Both are potentially valid explanations of the observation. Who would lose weight fastest on a water fast? Calories in, calories out... Obviously calories-in during starvation is solely supplied by lipolysis and protein breakdown, once glycogen is depleted. With a BMI of 50kg/m2 "calories-in" from fat breakdown are essentially unlimited, if they happen to be metabolically available. So weight loss should be determined by basal metabolic rate plus exercise/spontaneous movement. A fat person should have a slightly higher basal metabolic rate just to run the support tissue for moving their fat around, even if the fat itself has a relatively low metabolic rate. You must also remember that an overweight person is like me doing a squat with 60kg on my back every time they sit down and get back up again from a chair. So on both of these counts you would expect the fattest people to have highest "calories-out" and so lose weight more rapidly than less obese people. I data trawled and carefully selected choice points from table 1, discarding the half which don't fit the line. I used the blokes only. All is forgiven Dr Keys. 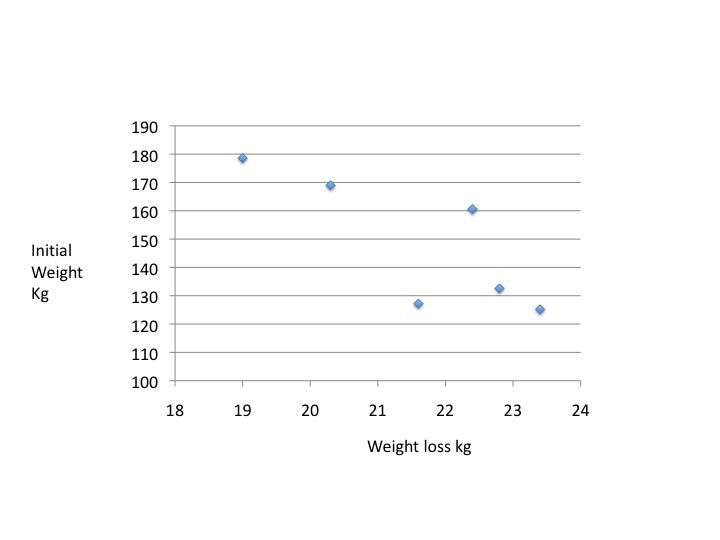 Plotting weight loss against starting weight gives a crude (negative) correlation for men. Let me be the first to admit that the relationship does not hold if you include the female subjects. Life would have been easier if we had been given individual starvation insulin levels, rather than having to take bodyweight as a rather crude surrogate. The three women outliers who ruin the plot are, interestingly, short stature. On a water fast the higher your starting weight (surrogate for "fed" fasting insulin, remote surrogate for "starvation" fasting insulin), the less weight you lose over 5-6 weeks. Of course addressing what causes elevated fasting insulin and why it doesn't normalise on prolonged fasting is a whole new ball game. People should look in to it. Carbohydrate restriction obviously gets you part way to sorting the problem. It side steps it rather than curing it. I have said this before. This post is a bit rushed so apologies for typos/grammar, but there is a just usable swell and low tide in First Bay is in just over an hour's time so the 'yak is on the car... Just need the Baba to wake up and we're off. 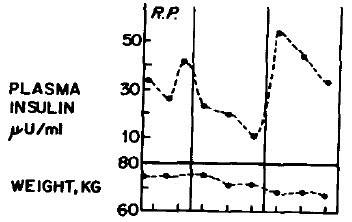 The LIRKO mouse has a leptin level which is 10 times that of a control mouse, despite having 10% less bodyfat, that's graph A. Does this mean it's fooling its brain in to thinking it is obese? Probably not, Graph B shows that LIRKO mice have almost infinitely more sOb-R in their blood. This is a binding protein for leptin, bound leptin is biologically inactive. 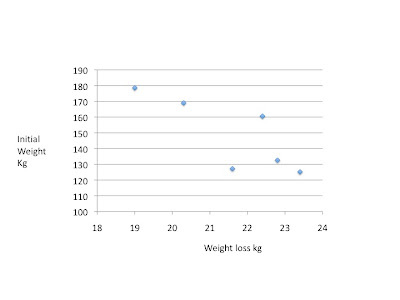 In graph C we can see that free leptin per unit fat mass is actually very low. But that's not what happens. 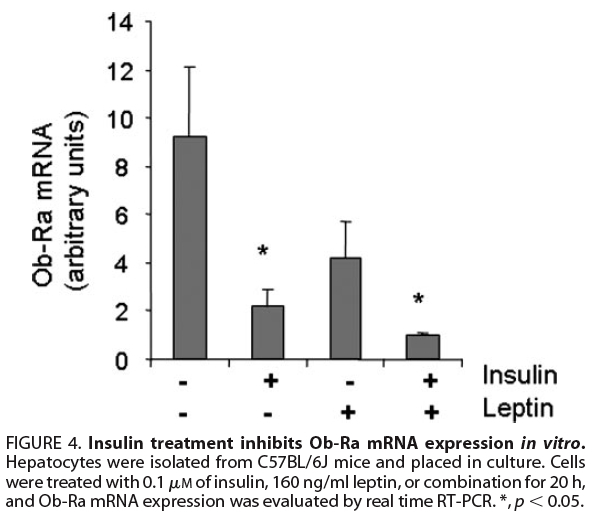 Four days of leptin injections drops appetite and weight more in LIRKO mice than in control mice. Despite the appetite suppressing free leptin index being higher in the controls. 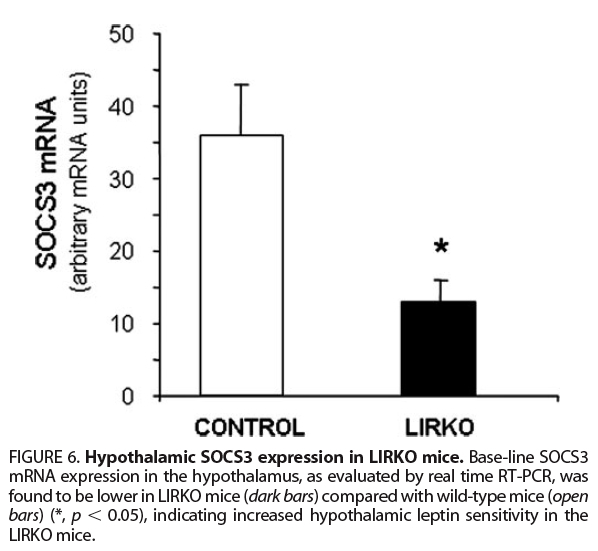 SOCS3 mRNA level is something I've not read about but I'm willing to accept that it is a marker of hypothalamic leptin resistance. Does any of this mean anything? Yes. The LIRKO mice have no hepatic insulin sensitivity because of a very specific genetic defect which deletes their liver insulin receptors. The liver does not know this. As far as it is concerned the pancreas is simply not secreting any insulin, ie there is no food being eaten. There may be a ton of glucose floating past but, as far as the liver is concerned, there is none. Are there any other conditions which mimic this and might also spike sOb-R? The paper cites three. Type 1 diabetes. Here there is a ton of glucose but zero insulin. Total insulin deficiency is "hepatically" indistinguishable from the LIRKO liver not seeing any of the insulin (or glucose) raging through the bloodstream. Low insulin in T1 diabetes. High sOb-R.
Anorexia nervosa produces a genuine combined insulin and caloric deficiency with a high level of sOb-R. Low insulin. High sOb-R.
Ditto a 72 hour fast in men. Low insulin. High sOb-R.
Now, where does the letpin binding sOb-R come from? The liver is the source in LIRKO mice. The LIRKO mice have liver cells which are in a starvation situation. They manipulate leptin binding and availability to keep appetite normal. What controls sOb-R production in normal liver cells? If you put normal liver cells in a petridish with insulin they reduce production of mRNA for the short leptin receptor gene which produces one of the sOb-Rs. Under zero insulin the mRNA level for the Ob-Ra gene is 5 times higher than under 0.1micromol of insulin. Leptin itself has some suppressive effect, but insulin is the dominant hormone. 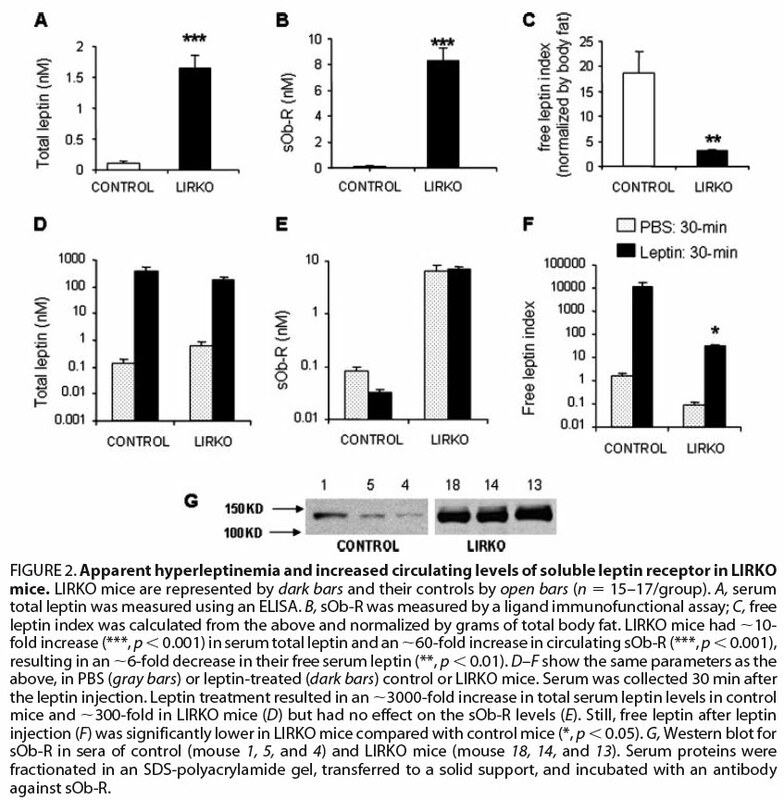 This looks very much like the liver has a mechanism for controlling leptin sensitivity. As a complete aside: The other potential mechanism for the decreased appetite is insulin per se. Now, we are all fully aware that insulin is anorexic agent. All you have to do is inject a little insulin in to your brain and you will decrease your appetite. This is logical, after a meal you have a high insulin level and shouldn't want to eat. Under fasting conditions you have low insulin levels and should want to eat. It's likely to keep you alive. Simple. For those of us who wish to lose weight without that intra cerebral injection we could try mainlining insulin. This may or may not suppress appetite. I've never tried it. Certainly none of my hyperglycaemic patients seem hungry when I inject them with insulin by the subcutaneous route. Until their blood glucose level drops below about 6mmol/l that is. At that point they will eat ANYTHING. And lick the bowl. I'm not sure if they feel guilty afterwards. None of them seem to go and make themselves vomit in private to stay slim. Difficult to hide the evidence in a ward cage! 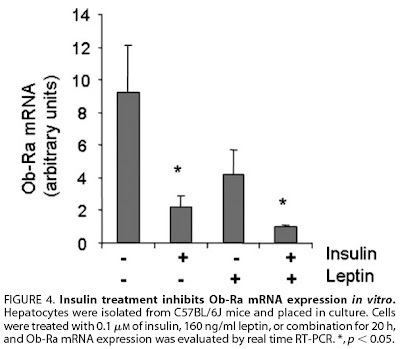 So perhaps we are actually seeing the anorexic effect of insulin in this mouse model. The levels might be high enough. The paper wasn't set up to look at this, but it's an interesting afterthought. Back to leptin. Finally, how does the hepatic insulin resistance of a LIRKO mouse compare to the hepatic insulin resistance of a sucrose fed mouse? They are in a state of hypercaloric stuffedness, they see blood insulin and glucose and just don't want anything to do with either. Do they make a ton soluble of leptin binding receptor, sOb-R? No. In human obesity leptin is high, sOb-R is LOW and hypothalamic leptin resistance high. Now, really finally, how does the LIRKO mouse type of liver insulin resistance compare to the hepatic insulin resistance of an extreme ketogenic fed mouse? It's exactly the same. Low insulin. So if you fed a LIRKO mouse an extreme ketogenic diet, would you "cure" its diabetes? If you based the ketogenic diet around butter rather than the almost pure PUFA in Mouse Diet 9F, would you prevent its cirrhosis? The liver is only getting its calories primarily from dietary fat after all. If you gave some LIRKO mice free choice of macronutrients ratio, would they put themselves on an extreme ketogenic diet to treat their diabetes? Of course they would. They're mice, they're not stupid. Do I like the LIRKO mouse? Absolutely. But the FIRKO mouse is even more interesting and paradoxical... Maybe another day. I think we have to look at the LIRKO mouse. This fascinating beastie was brought to my attention by Chris Masterjohn and it's hard to know where to start with how amazing these animals are. I suppose the first thing that grabbed me is that they are alive at all. They have no insulin receptors on their liver. None. You don't actually need insulin receptors on your liver to be alive... OK, they're pretty sick and go in to early liver failure, but they're definitely alive and reasonably functional at four months of age. They have fed-state plasma insulin levels TWENTY times higher than those of control mice and fasting insulin levels eight times higher than controls. They are the ultimate model of hyperinsulinaemia. They are, err, slim. Slimmer than control mice. Now that is cool! So we have mice with massive levels of insulin. If you took an average mouse and injected enough insulin to peak its blood concentration at 20 times the physiological level it would rapidly become an ex mouse. It would be a late mouse. It would be no longer. But that's not what's happening. It would be interesting to see quite how high insulin would go if there was not the urinary route out for glucose... The bilateral nephrectomised LIRKO mouse. There's an interesting ICU challenge! Does this massive hyperinsulinaemia inhibit lipolysis? Well, yes it does. Ultimately they don't become obese because they cut calories. They are ad lib fed, they must cut calories because they're not hungry. Gasp. Let's talk leptin. And insulin, of course. Vitro's Distort in the background. If we look at the extremes of substrate source for the provision of bulk calories we have the choice of either fat or carbohydrate. Under high carbohydrate intake we have high pancreatic insulin output and almost matched hepatic insulin extraction. Some insulin spills over in to the systemic circulation to facilitate bulk glucose utilisation but systemic hyperinsulinaemia and hyperglycaemia should be mild and within physiological limits (whatever they might actually be...). However there is a marked differential between portal vein insulin levels and systemic insulin levels, especially post prandially. Under extreme ketogenic conditions energy is sourced almost exclusively from lipids. Insulin has minimal involvement with hepatic glucose uptake because almost zero hepatic glucose uptake is going on. Extreme hepatic insulin resistance leads to minimal extraction of what pittance of insulin the pancreas is producing and you end up with the minimal possible difference between portal vein insulin and systemic insulin concentrations. What happens when someone needs to use insulin to maintain normal blood glucose levels? If your only route in for exogenous insulin is via peripheral injection you can, with ketosis, put the body in to a state where insulin is relatively unimportant. You do not have to plan for one concentration of insulin to hit adipocytes and muscles while (impossibly) targeting a far higher concentration to hit the liver. Under ketogenic conditions the liver is no longer a sump for insulin usage. In fact there is almost no sump for insulin disposal as it's not being much used for anything. Peripheral and portal insulin requirements are similar and can be met by the peripheral route. As you move from ketogenic eating to carbohydrate based eating the portal vein to systemic insulin difference has to increase and the problems of controlling hepatic glucose output while still allowing lipolysis to give access to adipose tissue calories becomes progressively more difficult. It's notable that successful diabetes control, as promoted by people like Dr Bernstein, uses mildly ketogenic macronutrient ratios, ultra extreme ketosis does not appear to be needed. Humans are not mice. Carbohydrate based diets would appear to lead to that wheelchair in the dialysis room and the incorrect impression that diabetes is an inexorably progressive condition. Let's look this abstract. Thanks to Liz for the full text. "In conclusion, despite preventing weight gain in mice, KD induces hepatic insulin resistance secondary to increased hepatic diacylglycerol content. Given the key role of nonalcoholic fatty liver disease in the development of type 2 diabetes and the widespread use of KD for the treatment of obesity, these results may have potentially important clinical implications." I'm not sure what the word for a collection of idjuts is. A moronity? Despite this the data are very interesting. Look at those hepatic diglycerides, up 350%!!!!!! Failure to suppress hepatic glucose output. Not just reduced, but reduced to zero percent suppression. Zero percent! Wow, are these mice gonna die of diabetes, fatty liver, metabolic syndrome, Spawn of Satan induced inflamasomation.... Okay, I'll calm down now. These mice are running their metabolism on a combination of free fatty acids and ketone bodies. What would you expect their liver to be full of? Sugar? Well, in ketosis FFAs come from transport by albumin or release by lipoprotein lipase as exactly that, free fatty acids. They are not stored in this form, they are re-esterified to triglycerides for hepatic storage. The 350% increase in diglycerides is not from being swamped with diglycerides exogenously. They are generated in situ specifically to stop the liver responding to insulin. These mice have no source of dietary glucose. They are generating and outputting small amounts of glucose from their liver, despite extreme protein restriction, to keep their blood glucose levels compatible with life. Possibly from glycerol. Then some joker comes along with an insulin infusion. What would happen if their ability to trickle out glucose actually did suppress in response to this malevolent tease? Death would ensue in a few minutes without a rescue glucose infusion as is needed for the mice on CIAB. Hepatic diglycerides are generated to stop the liver responding to insulin when survival makes this an absolute necessity. It's an absolute necessity under extreme ketosis conditions, even without the joker with a bottle of insulin. 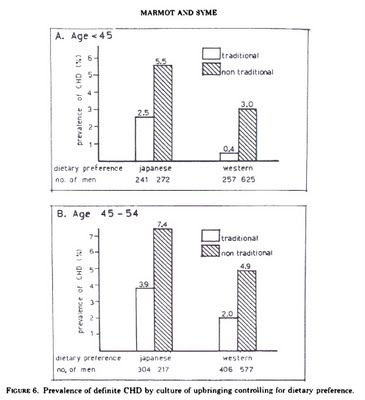 To get a breath of KetoSanity we can go back to the paper by Maratos-Flier's group (thanks to John for the heads up on this "non conformist"). "PAS staining showed decreased glycogen deposition in KD animals vs. both HF- and C-fed groups (data not shown)"
If your liver is glycogen depleted what, exactly, should it have as an energy store? Thin air? A small nuclear reactor? Maratos-Flier et al understand exactly what is going on and see no need to trot out hysteria about ketosis generating a fatty liver which is physiological. It has nothing to do with fatty liver under a carbohydrate based diet. Now, what would happen if we increased the carbohydrate content of the diet to 15% of calories in the same way as Axen and Axen did in their 2006 blooper? Ketosis would stop and hepatic insulin sensitivity would return. Probably within three days and certainly within the three weeks A & A allowed. The diglycerides would be gone. Probably so would the bulk of the triglycerides. Under these conditions carbohydrate would clear the fatty liver. Would the mice be diabetic? You've got to be joking. So why does carbohydrate restriction improve fatty liver in humans? I would suggest the lack of de novo lipogenesis due to fructose reduction coupled with chronically lowered insulin allowing VLDL output to clear the excess of hepatic triglycerides. The situation is completely different. I doubt many LC dieters would push themselves to the ultra extreme of the diet enjoyed by these KD consuming mice. If they did, their hepatic lipids, especially diglycerides, would have to increase to produce an utterly essential survival gift of hepatic insulin resistance. Their hepatic triglycerides would rise too. I think it's an open question about whether placing yourself at the very extremes of physiology is a good or a bad thing. It should certainly assist weight loss, but would it improve health? Interesting question.